Dil Bole Hadippa (formely titled Hadippa) is a forthcoming 2009 Bollywood film directed by Anurag Singh and produced by Aditya Chopra under the Yash Raj Films banner. It stars Rani Mukerji and Shahid Kapoor in pivotal roles with Rakhi Sawant and Sherlyn Chopra in supporting roles. The film is slated for a release on September 18, 2009. Its a good entertainer. 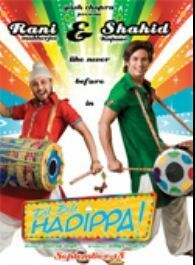 Shahid's bhangra dancing very good. Shahid-rani look good together.One more hit on SHAHID"S name.All the best for his future releases.